Opera Developer is the developer stream of the latest Opera browser. It is Opera for developers which is a bleeding edge version. You can expect a lot of fancy stuff there. However, it is most unstable and some nasty bugs might also appear from time to time. Opera Developer is using the WebKit/Blink layout engine Based on Chromium project. You could enjoy the speed, simplicity and security of the Chromium. In addition, it also has all new features including Speed Dial, Search, Stash, Discover to enhance your browse experiences. Note: Run launcher.exe to launch Opera Developer Portable. The current version is Opera Developer 21.0.1419.0. Pinned tabs - a nice beginning of future tabs improvements. Extension APIs - more API stuff to play with: bookmarks, commands, omnibox, webNavigation. Separated article with detailed API's explanation will be shipped later. Search engine manager - On top of the current shortcuts to search in the addressbar, (enter the one character shortcut plus your shortcut: "b" for Bing, "g" for google) you can now customize your searches, so go ahead and add "d" for duckduckgo, "m" for your own site, "o" for Opera desktop team blog, or anything else! Opera (Stable): Released every couple of weeks, this is the most solid version, ready for mission-critical daily use. Opera Next: Updated more frequently than Stable, this is the feature-complete candidate for the Stable version. While it should be ready for daily use, you can expect some bugs there. Opera Developer: Most unstable, all the cool stuff. A bleeding edge version, you can expect a lot of fancy stuff there; however, some nasty bugs might also appear from time to time. 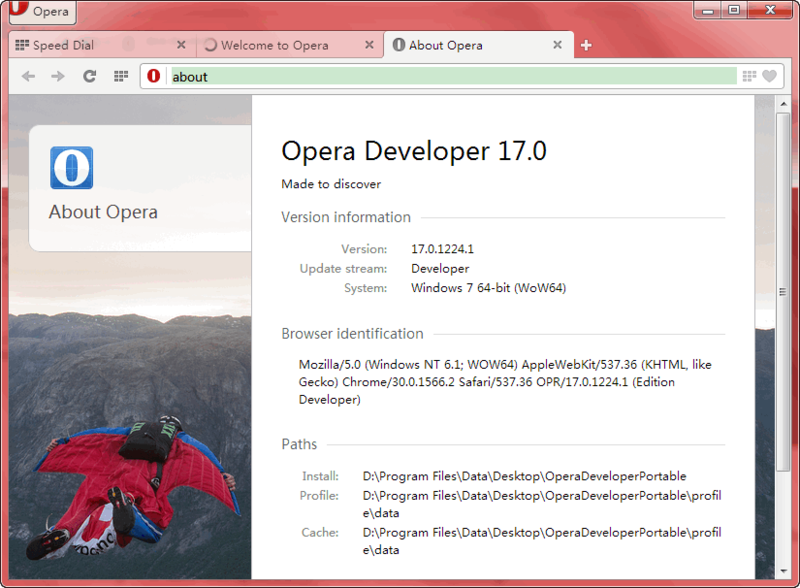 What's new in Opera Developer 21.0.1419.0? The main highlights is integration of Aura on Windows. Aura is a hardware-accelerated rendering of the browser, including the user-interface. This enables less taxing UI animations and a general sleeker and more responsive feel to the whole UI. This entry was posted in Internet Tools and tagged blink browser, browser, chromium, chromium portable, opera, opera developer, opera developer portable, opera portable, web browser, webkit browser. Bookmark the permalink.